Cat Stevens - also known as Yusuf - and Loudon Wainwright III will be presented with lifetime achievement honours at the BBC Radio 2 Folk Awards later. The two will perform at the ceremony at the Wales Millennium Centre (WMC) in Cardiff. The event will also feature performances by Welsh duo 9Bach and English folk singer Kate Rusby. There is also a posthumous honour for folk historian Dr Meredydd Evans, who died aged 95 in February. The Folk Awards are hosted by Radio 2 Folk Show presenter Mark Radcliffe alongside Scottish Gaelic singer Julie Fowlis, who is one of the nominees for singer of the year. Stevens, 66, had a string of hits in the late 1960s and early 1970s including Morning Has Broken, Moonshadow and Matthew And Son. 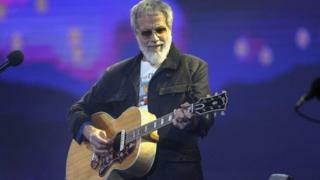 He converted to Islam in 1977, took the name Yusuf Islam, and gave up performing and sold his guitars for charity. Stevens returned to music nine years ago and has produced three new albums and started touring. Lisa Jên from 9Bach said she was surprised to learn that her album Tincian had been nominated in the best album category. "It was a huge shock when we found out we were nominated. We weren't expecting it at all, it means such a lot to us to be nominated." The album will be up against nominees including Nancy Kerr (Sweet Visitor) and father and daughter Martin and Eliza Carthy for The Moral Of The Elephant. Dr Meredydd Evans, who was known as Merêd, had been a driving force in the revival of traditional Welsh songs. His Good Tradition Award recognises an outstanding contribution to UK folk music. Jên said the honour for Dr Evans, who was known as Merêd, was a significant moment for traditional music. "I am so pleased that they see the value in such a giant as Merêd. Lately, I have been listening to his work an awful lot, and there's just nobody like him. "He has inspired all of us in Wales, and was one of those people you thought would never leave us. "His spirit is very much alive, and having people from outside Wales recognising him like this is a big deal for folk music, and not just for folk music but music more generally in Wales." As well as the sell-out ceremony, Welsh artists will also have a platform at the Wales Millennium Centre during the afternoon, with Kizzy Crawford and The Gentle Good among the singers taking to the WMC's free Glanfa stage. The BBC Radio 2 Folk Awards will be broadcast live from 19:30-22:00 BST on Radio 2, while video highlights will be available on BBC iPlayer after the event, and on the Red Button.